Diepenbrock made no alterations to his composition, which he orchestrated in October 1907 (see RC 81). Baudelaire’s poem is about the mystery of cats, who are loved equally by austere scholars and fervent lovers in their ripe season, and who – like them – are sensitive to cold and sedentary. Baudelaire depicts the proud, mysterious character of cats, how they assume the majestic poses of sphinxes, reclining in the depths of solitudes and dreaming a dream without end, the magic sparks in their loins and the particles of gold that glimmer in their mystic pupils. 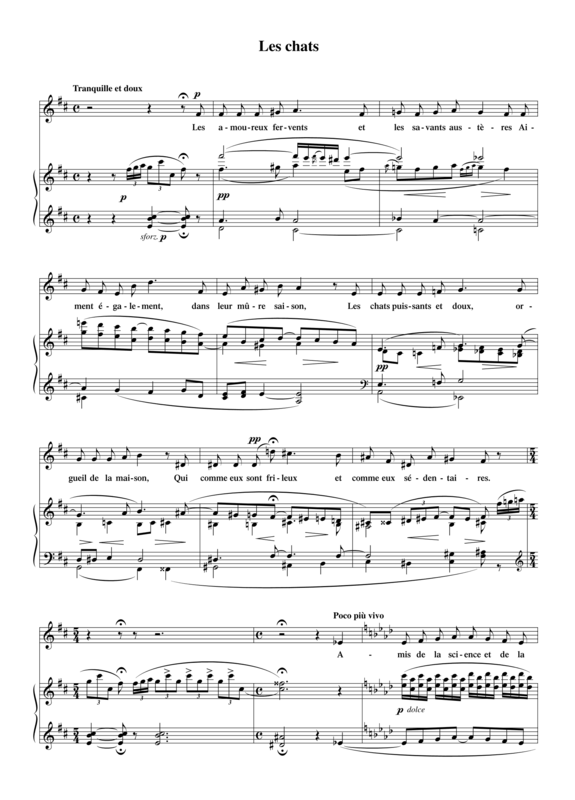 The form of the sonnet is clearly recognisable in Diepenbrock’s composition: to mark the end of each strophe the piano plays the same motive every time. Diepenbrock originally composed Les chats for alto in the Phrygian mode on e. This version of the song was premiered by Alice Plato (1889-19**) and Evert Cornelis (1884-1931) on 27 October 1915 and published by De Nieuwe Muziekhandel in 1918. In September of that same year the composer decided to transpose the song for the mezzo-soprano Berthe Seroen (1882-1957), first a semitone higher (see: letter to Seroen dated 27 September 1918), but on second thought also a whole tone higher (see: letter dated 28 September). She performed Les chats together with Evert Cornelis many times. Diepenbrock had already performed the song in public on 1 and 8 March 1916 with Anke Schierbeek (1878-1960) in the exhibition hall of the Amsterdamsche Handelsbank at benefit concerts for Belgian war victims. semi-autograph A-80(13) with dedication on the first page A J.J.
27 okt 1915 Eerste uitvoering van de Berceuse voor mezzosopraan en piano (RC 112) door Alice Plato met begeleiding van Evert Cornelis in de Kleine Zaal van het Concertgebouw te Amsterdam. Op het programma staat ook Les chats. Oberstadt componeerde La chanson de Marie-des-Anges, het gedicht van Jean Richepin; dit en twee liederen van Diepenbrock, Berceuse en Les chats, verdienden onze belangstelling 't meest.